On an interesting note, almost all of the paraphernalia on the left-side of my monitor is greyscale. Go figure. 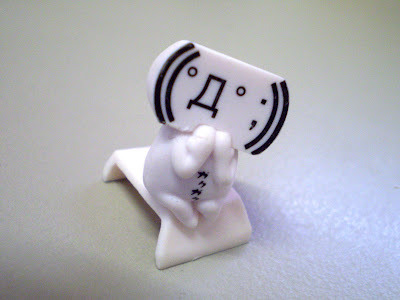 I picked up this little guy in a gashapon machine as I liked the typographical qualities of the toys the machine offered. To my knowledge, it's ">>1-san" from a Japanese BBS. However the description doesn't completely fit, so I'm not sure who he really is and if, indeed, he really is a he. His mouth is comprised of the Cyrillic letter 'De' and he looks kind of frightened or stressed.